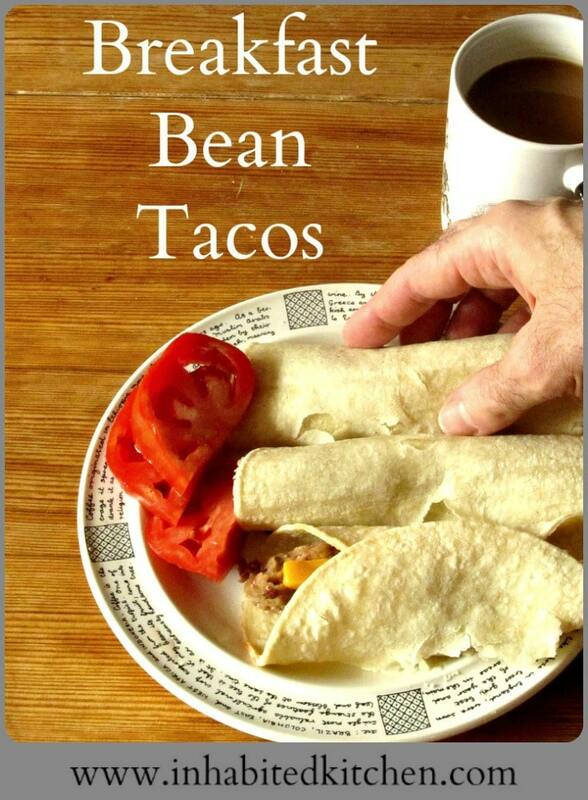 Corn tortillas, seasoned beans, and cheese all come together in Breakfast Bean Tacos, a quick and easy, gluten free breakfast! Every week (or almost…) I write the What I Ate Wednesday post. I started when so called Link Parties were common – someone would set a theme, bloggers would link posts that followed the theme, and people interested in that theme – those bloggers, surely, but other readers as well – would go look at the posts, and find information and interesting blogs to read. Every so often I realize I’ve been blithely posting a meal that I have never told you how to make. Now, sometimes you don’t really need much by way of directions – the summer long salads for lunch, for instance. (Though enough posts of specific salads do well on other blogs, maybe I should do that, once in a while! When I have something particularly good, I guess…) But some are not as obvious. I have regularly eaten a breakfast I call Bean Tacos. As usual, I don’t claim these are authentic anything other than my own breakfast, but I find they work very well as that. Once the beans are cooked, everything else assembles in no time – and it’s a tasty, nutritious, filling breakfast. You can even eat it quickly and easily! I’m sometimes at the computer with tacos on my left and coffee on my right… munching breakfast while I scroll through email. If you have a family and everyone hits the kitchen at a slightly different time, these are ideal – just wrap and zap for each person as needed. A note about the beans. I have frequently used pintos, and they’re great in this. I love varying them, though – each bean gives a slightly different flavor and texture. I’m fond of black beans or red or pink beans (I can’t help it – so many beans are named by the color!) 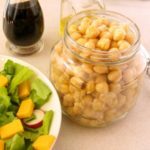 White beans never seemed quite right in this one, but if they sound good to you… I often use Roman beans, though they’re not really my favorite – I think they cook a little too soft – but they’re the easiest for me to get in big bags, so I usually have them on hand. And while I often use dried beans I have cooked in bulk the day before, canned beans are just fine… sometimes I make a point of picking up a few cans of a kind of bean I have not cooked lately, just for variety! So, heat some olive oil in a pan – a little more than you might usually use, as it adds a touch of richness and flavor to the beans. 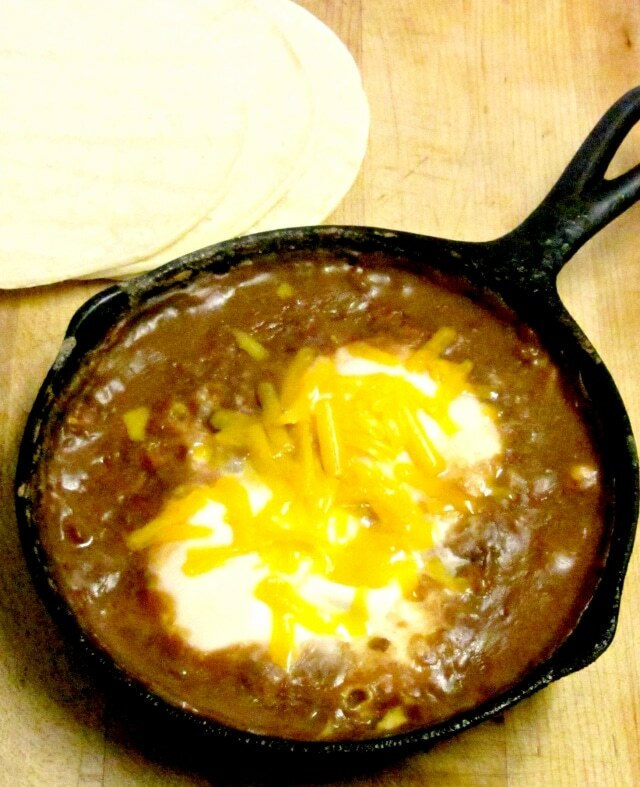 Mince half a jalapeno (or more, if it’s small or you like the heat!) and add it. 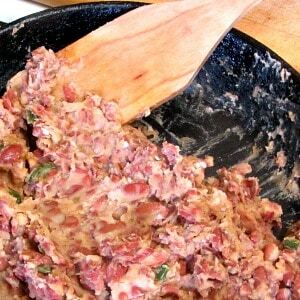 I sometimes use an Asian chili paste instead, just because it is convenient… You could add a touch of minced onion or garlic if you feel ambitious, but in the morning, I don’t – we’re doing well when I remember the chili! As the jalapeno softens, add cumin, and stir. 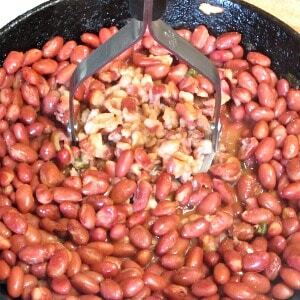 Then add three cups of cooked beans (or two cans,) rinsed and drained. Stir them around to distribute the seasoning, and add half a cup of broth. I used ham broth, here, that I had from the last time I cooked a ham and simmered the bone, but you could use any other kind that you have or that sounds good. (Obviously if you are vegetarian, use a vegetarian broth!) If you don’t make your own, commercial gluten free broth works. You can use just water, but I like to get some flavor from the broth. Simmer all that about five minutes. The beans are softer when they are heated through, and they pick up the flavor of the broth and seasoning. Then mash them – I use a potato masher, I know some people use an immersion blender when making a big batch, and a fork will do in a small batch… The beans will absorb much of the liquid. Stir that around, still over heat, for a minute until you have the texture you want (and bear in mind that it will firm up as it cools.) Put that aside. Now – for each person, take three corn tortillas. I find that different brands have very different textures (and in our store, at least, we don’t always know which brands will be available on any given day…) so you may want to try a few to find which ones you like best. Microwave them for 30 seconds to heat them – this makes them soft and pliable. And I use cheese – usually cheddar, Monterrey Jack or pepper jack occasionally (we don’t always have it in our store.) Cut about an ounce and a half of cheese, per person, into six sticks. 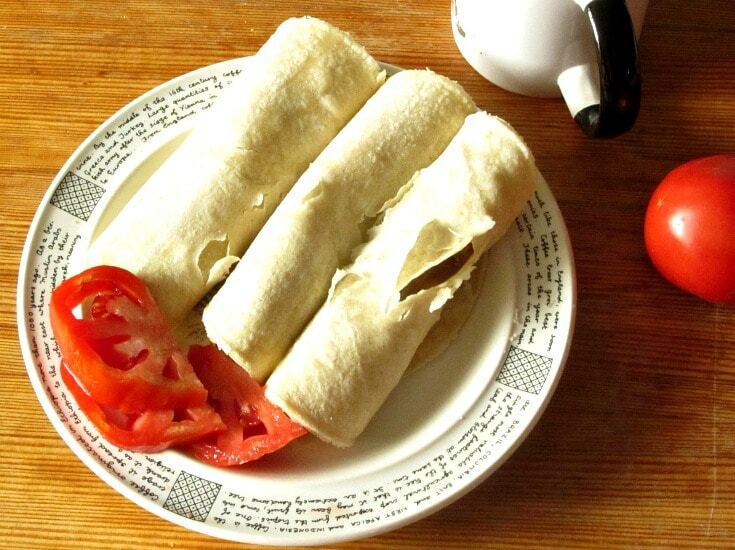 And if you think these sound remarkably like breakfast bean burritos, you’re probably right. 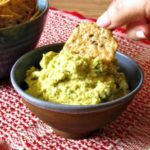 I never liked flour tortillas to begin with, so when I went gluten free I was delighted to find that most corn tortillas were safe, and I never bothered hunting up a gluten free flour tortilla! 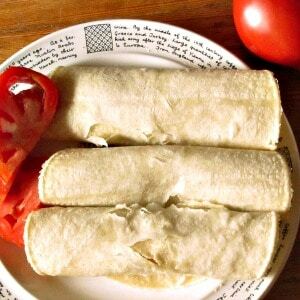 But if you’d rather use a larger flour tortilla and make one or two burritos instead, go for it. Heat oil in a pan, add the jalapeno and cumin. Stir until the jalapeno softens slightly. Add the beans, and stir. Add the broth. Simmer about five minutes, until beans are heated through and they've absorbed some of the broth and seasoning. Mash the beans. Stir them in the pan until they absorb most of the liquid. Set aside. Take 3 tortillas for each person. Microwave for 30 seconds to warm them and make them pliable. Cut cheese into six sticks per person. Use 1/4 of the bean mixture for 3 tacos. 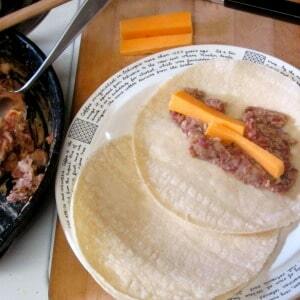 Put a spoonful in a tortilla, add 2 pieces of cheese and wrap the tortilla around the filling. Repeat with the other two tortillas. If the bean mixture is still hot, serve. If it has cooled, microwave 1 minutes to reheat. I love a hearty savory breakfast like this! Where I grew up in Panama we would often have a traditional breakfast of a thick corn tortilla and you top it with cheese or ham. The cheese and beans sound great too! Thanks for sharing! That sounds good! I've used ham once in a while, but tend not to think of it... But really, you can do almost anything with it... Thank you! Mmmm. These bean tacos look fabulous. The only thing I'd do differently is to use flour tortillas as I don't like the texture of corn tortillas! I can not wait to try your delicious recipe! LOL And I use corn tortillas because I never did like the texture of flour tortillas. To each her own - isn't it nice that we can vary it so easily! Thank you, and enjoy it! We love breakfast burritos and tacos! They are such an easy meal to put together. Plus, they're filling. These would be great for an easy weekday breakfast. They sound awesome. You hit all the points... ;-) We just love them. Thank you! These look really yummy. Tacos for breakfast are always a great idea. These would probably reheat from the freezer well for a large batch too! Thanks! Probably - but they're so fast and easy to assemble I never even thought about it. (And I do not have freezer space for that...) If you try it, I'd love to hear how it goes! Oh this sounds like a weekend breakfast or brunch treat in our home. So hearty and sumptuous. I love the sound of smoky cumin in there. I can almost smell the flavor coming thru. That touch of cumin adds so much! Thank you, and enjoy them! I love anything 'taco-like'. We go through a lot of tortillas at our house - both corn and flour. :) I'd love to eat these for breakfast or anytime! LOL I don't actually limit them to breakfast. Pretty good lunch, too! Though at lunch I'm a little more apt to add a little salsa or tomato or... anything that takes some shred of brain. Breakfast is pretty stripped down. Thanks! I love this but I never would've thought of eating it for breakfast! It looks filling yet healthy too! LOL It does take kind of a mental jump - but I learned long ago that beans for breakfast work really well for me! And it is filling, without being heavy. These look perfect for the freezer! Looking forward to making them so that we can enjoy on busy morning. i love wraps and tacos. This is such a quick and easy preparation. Am surely trying this soon.Thanks for sharing. These sounds great- I should make some ahead and freeze them! The hubs always ends up getting McDonald's burritos when we don't have time for breakfast... these look better!! This looks like the perfect recipe to start the day off with. YUM! I like beans and cumin together! These bean tacos must be delicious! Several cultures hit on that combination - and with good reason! Thank you, they are!